Since time immemorial (well, 1992 anyway), racing games have sought to mine the source of Super Mario Kart’s social gaming magic. With eighth-gen technology able finally to provide a sturdy four-player split-screen experience with full fields of A.I. competitors, it’s little wonder that kart racers have enjoyed a recent renaissance. ​Vector Unit’s Beach Buggy Racing may not look a million dollars (it was, after all, based on a mobile game), but it’s a solid racer with heart and personality. You do have to persevere a little though; BBR delivers a decidedly tepid opening few plays, with the slowest of the four speed classes making for an underwhelming experience, at least initially. The player is constantly vulnerable to attack from the aggressive A.I., and defending a lead can be a genuine challenge as the gaps between power-ups (and much-needed defences such as shields) is far more protracted than in later speed disciplines, making things surprisingly tricky early-doors. 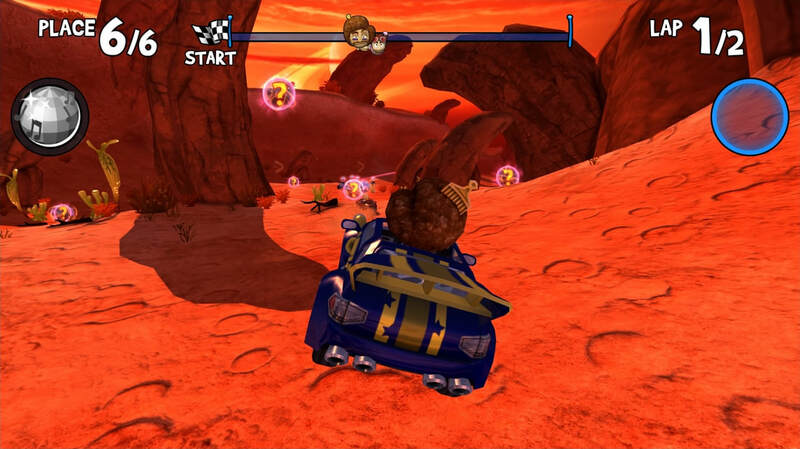 The 50hp class also draws attention to the game’s sluggish handling and hyper-springy physics. The sheer lack of speed proves a real hindrance, as the karts are sometimes unable to make jumps or shortcuts. Beach balls, everywhere! Every one of which creates a springboard effect upon impact. It's particularly useful when unleashed in tunnel sections. The opening few tracks are some fairly low-rent efforts set around beaches and seaside towns, and at this stage, things seem an awful long way from “Rainbow Road”. The outlook isn’t as grim as it sounds however, and it’s worth noting that Beach Buggy Racing steadily improves from here on in, with circuits yielding greater ambition and the faster speed classes proving more enjoyable. Highlights include the snowy precipices, yetis and avalanches of “Blizzard Vale”; the formidable, volcanic “Death Bat Alley” and the marvellous, low-gravity/high-jinks fun of Red Planet. Whilst fields of six competitors might seem a little sparse by modern expectations, the racing is always close and competitive, making for some breathless races. It takes a bit of time to show it, but BBR has plenty of personality, as showcased by the wonderful character selection screen and madcap power-ups. As well as relying on some familiar tropes, there’s some marvellously devious weapons that add to the havoc. 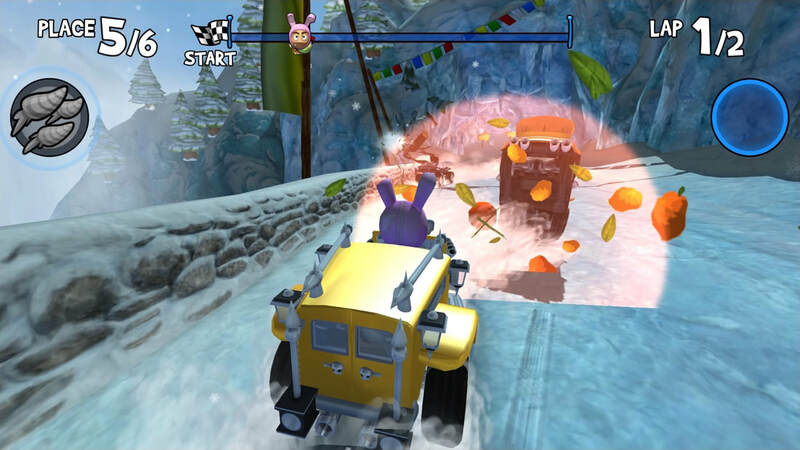 Careful placement of springboards can see competitors launched clean off the track, whereas the remote control allows the player to sabotage a competitor’s steering for a brief period, and dynamite sees all other racers lumbered with explosives – a collision with anyone, or thing, will cause it to detonate. Every character possesses their own special power-up, deployable once per race, and in the case of Beach Bro’s, which scatters bouncy beach balls in all directions, they can cause absolute mayhem. 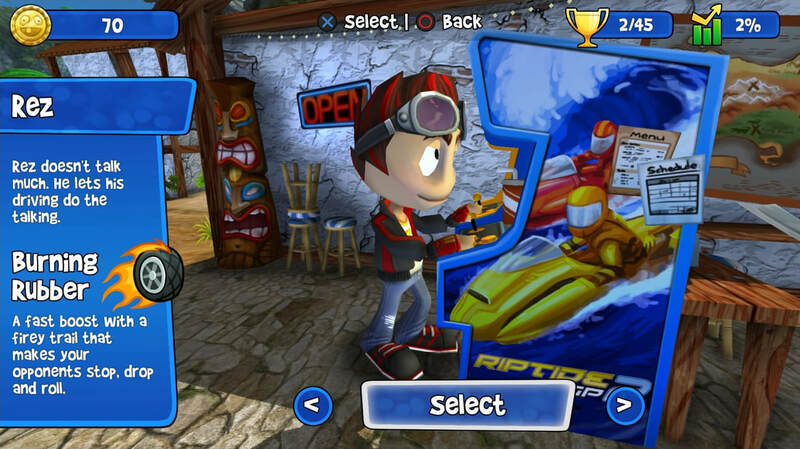 The power-ups add a lot to the experience, and are a great source of fun when used in multiplayer races. Shortcuts. Wow, that’s original Tom. I know, they’re practically a mandatory feature in kart racers these days, and Beach Buggy Racing is no different. What does set it apart however is the cheerful proclivity with which the computer A.I. like to take advantage of them. The player must therefore also pick out the routes (often through keeping an eye on the opposition) and be willing to take the riskier paths, in order to come out on top. In other words, they’re not an after-thought, but a fairly integral part of getting one over the opposition, and some of the trickier shortcuts require a fair bit of practice and gumption to come through unscathed. An extensive one-player campaign involves races, time trials, follow the leader and target events, with three stars up for grabs in each instance. 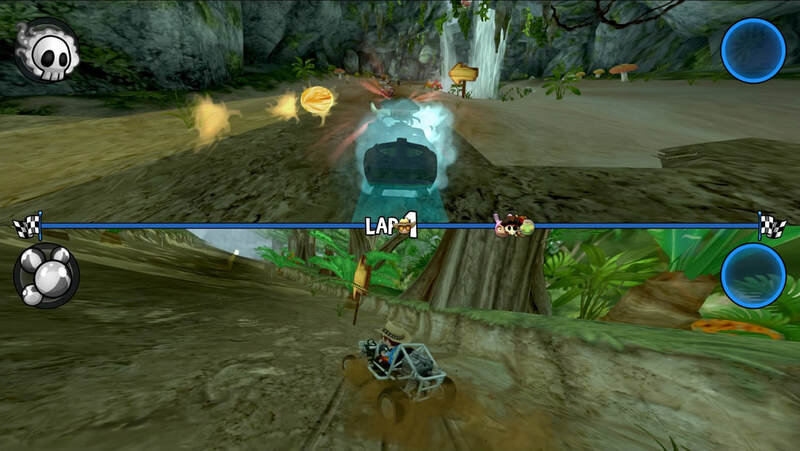 Head-to-heads allow the player to race one-on-one in an attempt to win a new character, though these encounters can be unnecessarily trying due their repeated use of the special power-up. There’s a raft of multi-race tournaments which are especially good fun with a friend, and it’s also refreshing that the race order amongst the A.I. varies race-by-race, so you’re not limited to battling the same chief competitor every time. With credits up for grabs in all forms of racing, the player can upgrade and customise the different karts which, as you might expect, range from speedy sports cars to weighty monster trucks, all with their own characteristics. Red Planet plays host to some funky, low-gravity physics. Picking the quickest route through the rocks is key. 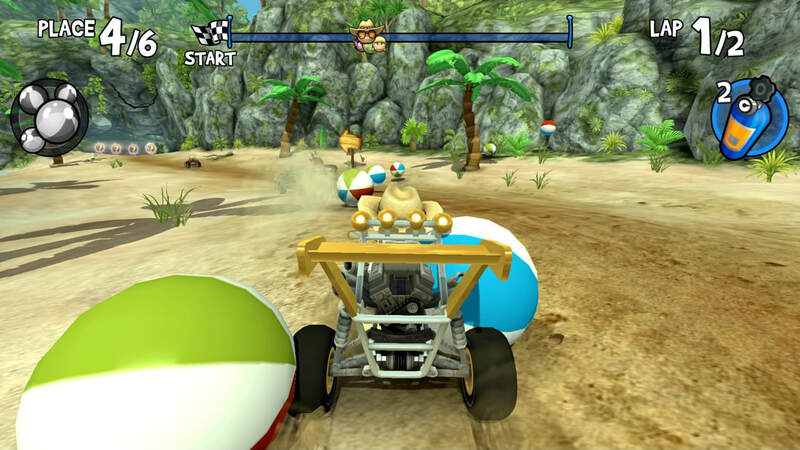 Beach Buggy Racing offers a robust challenge, and whilst it can prove frustrating and punishing at times, learning the tracks and the nature of the power-ups does eventually reap its rewards. It’s a little bit bargain basement in the wake of Mario Kart 8 and Cars 3, but it does actually offer a more significant one-player campaign than either of the above, and is likely one of the toughest on the market. Vector have gone to considerable lengths to ensure long-term options for both single-player and multiplayer pursuits, so whilst it loses points for its underwhelming visuals and no-frills game engine, BBR does represent excellent value for money. It’s no exaggeration to say that polishing off all the career events, tournaments and trophies will take months. Whilst it’s a bit of a shame there’s no online multiplayer, the split-screen options are still extensive and enjoyable. 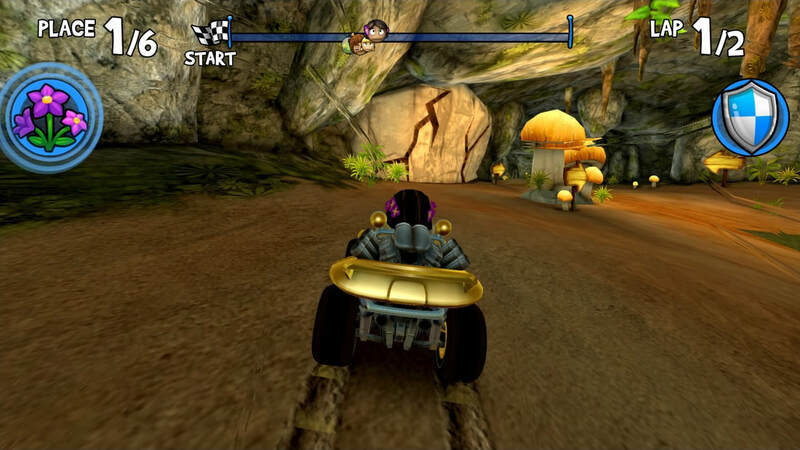 There are better kart racers available, but there’s still room on the market for Beach Buggy Racing, which delivers an engaging, fun experience that will please committed fans of the genre, even if it may not win over occasional gamers due to its strict and often-punishing difficulty level. 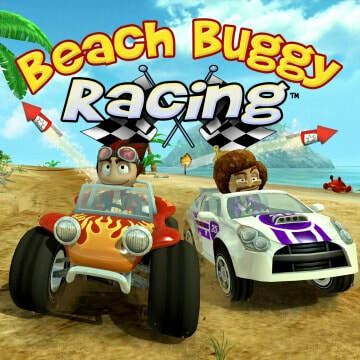 "There are better kart racers available, but there’s still room on the market for Beach Buggy Racing, which delivers an engaging, fun experience that will please committed fans of the genre"